Once a torturer, always one, the high crime an indelible stain on Gina Haspel’s despicable record. Confirming her as CIA director assures continuation of virtually every conceivable form of agency lawlessness – including torture Haspel publicly repudiated, saying one thing, supporting another. Six undemocratic Senate Dems joined nearly all Republicans, confirming her by a 54 – 45 margin – following a Senate Intelligence Committee hearing days earlier, mostly lobbing softball questions at her, failing to hold her feet to the fire for ducking semi-hard ones. Don’t let her gender fool you – a she-devil as vicious as the worst of her male counterparts. Her despicable record speaks for itself. “Gina Haspel is the right woman at the right time” – to head Langley’s torture program and other criminal activities worldwide, it failed to add. She’s “the new face of America’s intelligence community” – its actions incompatible with democratic governance. Former naval reserve officer/current Professor of Public Health Dr. Sondra Crosby has extensive experience evaluating torture victims. 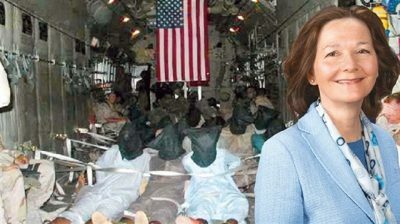 Haspel bears full responsibility for destroying him, currently held at Guantanamo, charged with masterminding the 2000 USS Cole bombing, killing 17 US sailors – being tried in a lawless military commission, a capital case without a death penalty lawyer representing him, in March proceedings suspended. In 2009, charges against him were dropped, reinstated in 2011. Before sent to Guantanamo, he was held in five CIA black sites. Bloody Gina’s dirty hands were responsible for bringing him to the brink of death from severe torture, then reviving him for repeated episodes – transforming him to zombie state, a living dead man. She’s now in a position to order industrial-scale torture and abuse on countless other victims of US savagery.